Working with scientists in 14 countries across Europe, ESA is developing a warning network that will help protect us from the effects of our Sun’s activity. ESA’s Space Situational Awareness efforts now generate almost 60 ‘products’ – including high-quality measurements, forecasts, alerts and expert analysis – from teams participating in the Agency’s space weather network, heading for over 140 next year. Many use realtime data on our Sun and the resulting disturbances detected in the environment around Earth, our atmosphere and down to the surface. The raw information is gathered from a large and increasing number of ground and space sensors, and delivered through a network of Expert Service Centres, established by ESA to combine and build on existing facilities in Member States. 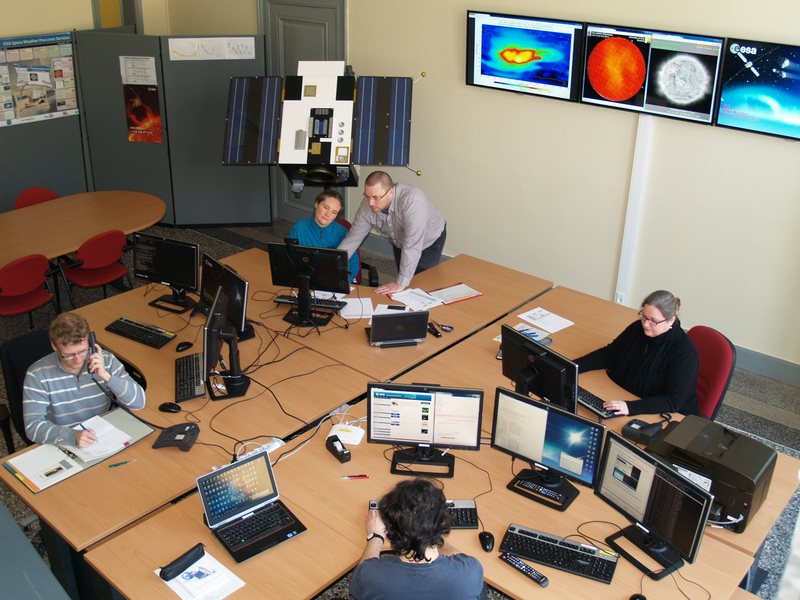 “The Centres federate the wealth of space weather expertise and capabilities that exist at the national level,” says ESA’s Alexi Glover, responsible for network development. Numerous sectors are potentially affected by space weather in Europe’s economy, ranging from telecoms, broadcasting, drilling, exploration, navigation and power distribution, the latter especially at northern latitudes. The Sun causes ‘storms’ within Earth’s magnetosphere when giant eruptions from the Sun’s outer atmosphere – Coronal mass ejections (CMEs) – wash across our planet. The most recent very large event occurred in 2012, though it missed Earth. Lesser CMEs happen regularly and do reach the planet, affecting daily economic activities. ESA launched its space awareness effort in 2009 in part to develop a Europe-wide capability to monitor, study and warn about such space weather effects. 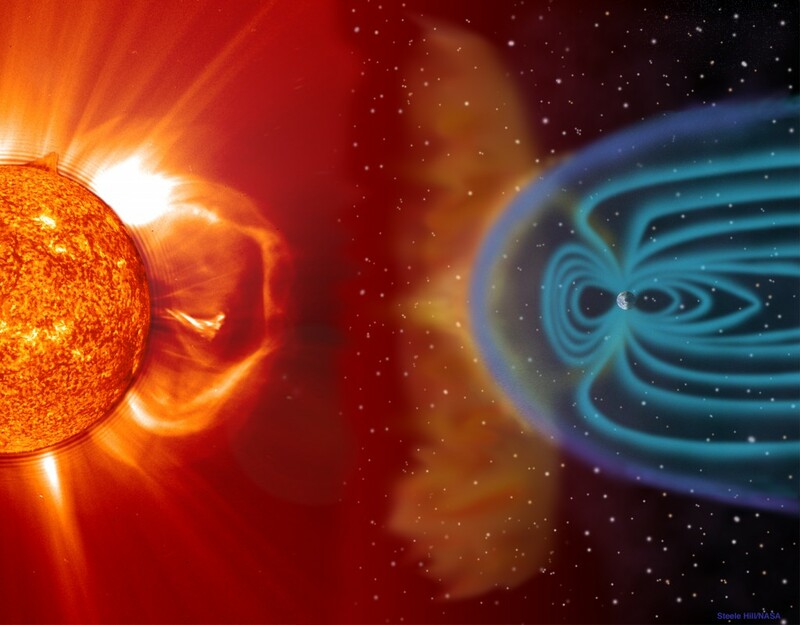 “The current expansion of the network, interconnected via ESA’s Space Weather Coordination Centre in Brussels, Belgium, brings to fruition several years of work,” says Juha-Pekka Luntama, ESA’s space weather manager. Today, the available products provide information on realtime solar activity, solar flare forecasting, geomagnetic activity, ionospheric activity and radiation levels both for satellites in orbit and, closer to the ground, at aircraft altitudes. These products rely on data gathered by sensors developed and operated by industry, national space agencies and academic institutes across Europe. Data gathered by ground and space sensors are processed and presented to the users as targeted space weather products by the five Centres, one each focused on solar weather (coordinated by the Royal Observatory Belgium), heliospheric weather (STFC RAL Space, UK), space radiation (BIRA-IASB, Belgium), ionospheric weather (DLR Germany) and geomagnetic conditions (Tromsø Geophysical Observatory, Norway). ESA’s Proba-2 Sun-watching satellite also contributes. In the near future, instruments on satellites operated by a number of ESA partners will be flown, and the Agency is studying a dedicated mission for early warning of coronal mass ejections and other space weather events. ESA’s network is providing data that indicate solar effects on diverse economic activities including aviation (polar flights are sometimes diverted when solar radiation levels are high); navigation and telecommunications (satellite radio signals are especially sensitive to space-weather-induced disturbances in the upper atmosphere); pipeline and power grid operations (geomagnetic activity can induce electrical currents disturbing operation of power grids and cause increased corrosion in pipelines); and precision oil and gas drilling. 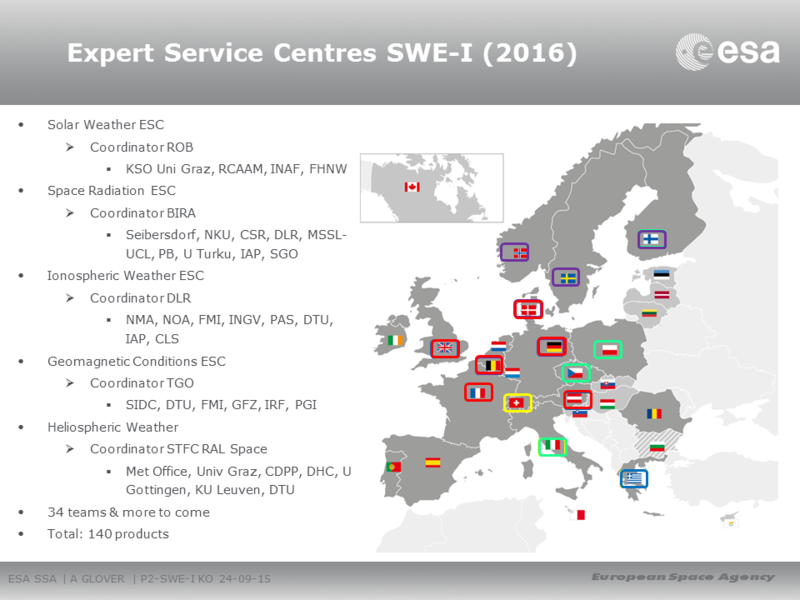 In 2016, ESA’s space weather network will grow to encompass over 140 separate products providing scientific and pre-operational applications as part of 39 services provided to users. “The development of space-weather precursor services in Europe is a growing success, and also promises commercial opportunities that we could not foresee just a few years ago,” says Juha-Pekka. In addition to business and government agency uses of space weather data, he points to opportunities for application developers who could use realtime information to serve, for example, the tourist industry, as many Nordic hotels and tour operators would like to offer predictable aurora viewing. The next steps for the space weather network include developing and federating additional data sources, integrating new models and tools as well as ensuring that the network is robust, redundant and able to provide actionable information on demand. The thick lines indicate the countries that are or will be taking part in ESA’s Space Weather network within 2016.